Organizers of Lagos Fashion and Design Week (LFDW), Style House Files, announced partnership with Heineken as the new headline partner for LFDW 2015. For the past 5 years, LFDW has remained dedicated to the growth and promotion of creativity in the industry by nurturing, fine tuning, rewarding their skills and providing them with a solid platform for achieving their goals. This vision is primarily centered on providing on-going support to designers via mentorship, education and capacity building as well as opportunities to present their work before an audience that facilitates commerce. “Heineken is passionate about design, it’s in its DNA and since the introduction of the first green beer bottle, it has been creating innovative designs for a variety of social environments. Heineken affirms its commitment to young designers and consumer-inspired innovation through its global Open Design Exploration programme. Positioned in the Heineken LFDW Lounge, this pioneering and experimental space is a must-see in this year’s LFDW schedule,” remarked Senior Brand Manager – Heineken, Mrs. Ngozi Nkwoji on the partnership between LFDW and Heineken. Omoyemi Akerele, Executive Director and Founder Lagos Fashion and Design Week acknowledged the synergy between Heineken’s passion for design and the LFDW vision. She said “At the heart of the Lagos Fashion and Design Week platform is the fundamental vision to position Lagos as a global destination for Africa’s finest fashion design talents. Through LFDW, they present their collections, grow their fashion businesses and contribute to the sustainability of Nigeria’s Creative Economy”. As the LFDW platform prepares for its fifth year anniversary scheduled for October 28th to October 31st 2015, activities have kicked off with a call for entries for LFDW Fashion Focus. Fashion Focus is a collaboration between Heineken LFDW and British Council that’s supported by Fashion School Istituto Marangoni and Grey Velvet Nigeria. It is a yearlong initiative with a vision to fine tune the existing Heineken LFDW strategy to support the professional development of emerging fashion talent in Nigeria. Fashion Focus will scout for, support and develop emerging creative talent that can stimulate the growth of Nigeria’s fashion industry. This is in sync with British Council’s ongoing work to develop innovative, high-quality events and collaborations that link artists and cultural institutions in Nigeria with their counterparts in the UK. 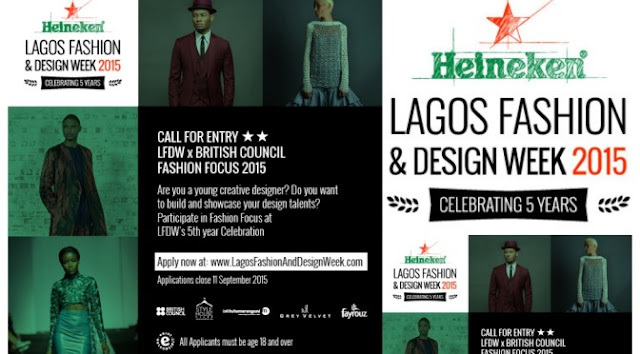 LFDW Fashion Focus offers fashion designers opportunities to be participants at targeted workshops and networking sessions between 2015 and 2016, as well as a chance to exhibit their collection at Heineken LFDW 2015. LFDW 2014 Fashion Focus Finalist, Temitayo Ilesanmi Nathan was invited to present his work at British Council X British Fashion Council’s International Fashion Showcase 2015 at London Fashion Week earlier on in the year. He summarises his LFDW Fashion Focus experience as a “defining moment for my brand and me as its Creative Director. Heineken LFDW sponsors Maybelline and Fayrouz will lend their continued support to Heineken LFDW as the brands continue to be positioned as stakeholders in Nigeria’s rapidly evolving fashion industry.